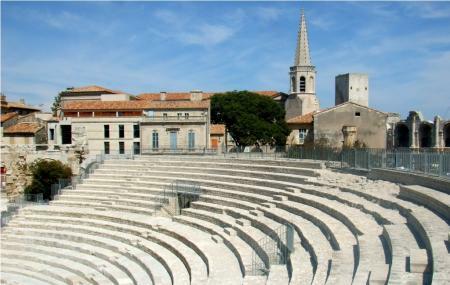 Once, a great fortress, the Theatre Antique d’Arles or the Ancient Theatre of Arles is now a gorgeous historical site. The grand structure possesses immense power to mesmerise human minds. Built in 12 AD by Emperor Augustus, the Theatre shares a rich history and is a world heritage site. Even though the Theatre was initially many storeys high, today it is still a grand site exuding with Roman charm. Every brick and stone exhibits beauty and elegance of the ancient times. The cavea, or the amphitheatre is huge and at the time could accommodate 10,000 spectators. Other monumental pillars and columns are etched with intricate carvings and the theatre on the whole is a great architectural exhibit. The construction of the theatre dates back to 1st century BC. Today, in the ancient roman settings, outdoor plays and concerts are still held during the summers. To soak up history, beauty and fantasies, the Theatre is the perfect place to visit. Free Entry with Les Arenes admission. How popular is Theatre Antique D'arles? People normally club together Place De La Republique and Amphitheatre D'arles while planning their visit to Theatre Antique D'arles. Lovely visit to this theatre. Would be great to have seen a performance here. Very nice Roman remains of the old theatre. Well worth a look. If you don't want to pay admission for a wander round then it is possible to view the overall structure from the outside in various places. It is great that this is still actively used for shows and is not just a museum piece! This venue is so beautiful and you can see the ancient Roman. I'd like to see a concert here. This place is a nice (short) visit but an incredible venue for a concert. Arrive early to grab good seats in the middle, in the first couple of rows (but NOT the first row), sit back and enjoy. With luck, you can grab something cold to drink at the Theater's bar.